In August, the Tacoma Dominican Sisters and associates joined with the Sisters of St. Francis of Philadelphia in a collaborative service project for the Year of Consecrated Life. 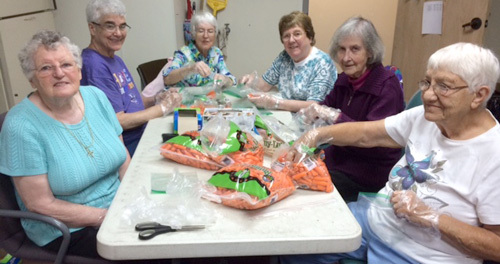 During the day, different teams came together to package pretzels, carrots, animal crackers etc. for the Hospitality Kitchen for St. Leo’s, Tacoma. Each day, lunches are packed and served to children in need at several area schools. “This need is ongoing, and we all felt that we wanted to do this again,” said Sister Sharon Casey, OP.